Is price difference between International and Domestic favorable to import? The situation and news are available related with the export opportunities of Indian exporters. The Statistics of export and import will be available after two months. At that time nobody will check the previous export and import. There is no objection for the big manufacturers on low priced export. May be on three reasons. 1. Exported rubber can be imported vice-versa. 2. The low priced exports are to reduce International price. 3. Main exporters are from co-operative sector who don’t want to show maximum profit. The International price of RSS 3 was not available to Indian Rubber Board on 17-07-08 & 18-07-08. However media published the International week end price as 135.68/Kg for RSS 4 (actually this price was for SMR 20) which is not published by the Rubber Board. 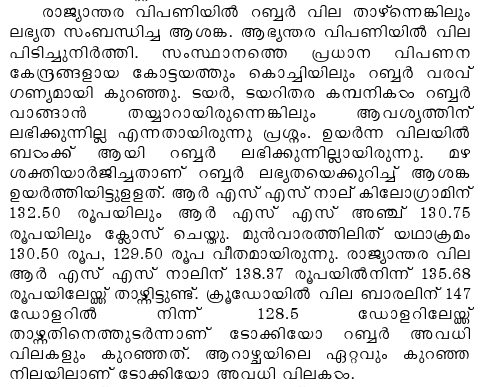 The week end prices shows the mistakes published by Mathrubhumi Dhanakaryam. The domestic price of India will be higher than International for one week to get sufficient month end stock for July 2008. The possibility of rubber exported earlier at lower prices may come back as Import within this week to Indian ports. Indian Rubber Board will publish stock with farmers also higher than one month production. The 10 days production may be with growers at this higher prices of RSS and Latex. For eg. I will sell the stock with me before the end of this month and stock balance will be available below 25 kgs on my monthly production approximately 150 kgs. Increased demand from China, the US, Europe and India should keep demand for Sri Lankan natural rubber, and prices, high. The domestic rubber prices flared up sharply above the international rates on Tuesday. It is the news in media about abnormal scarcity of the commodity in the market . On first week of August the same media will publish that the month end stock is so high (including figures of Stock) which will publish after 40 days by Rubber Board.